Recruiting and reactivating hunters is an integral part of securing the future of our hunting heritage. As a hunter education instructor, you are uniquely positioned to teach new and lapsed hunters how to be responsible sportsmen, practicing safe and ethical behavior. If you are an NWTF member, who has instructed or co-instructed a hunter education class from September 2012 to present, you qualify to be entered into a drawing to win a Henry Silver Boy rifle! Click here for details! Click the links at the top of the page to find your NWTF field staff and local chapter contacts and when and where to find your local NWTF events. You'll also find links to the National NWTF web site and other web sites that have interesting information for Arkansas sportsmen. Get your NWTF license plate! 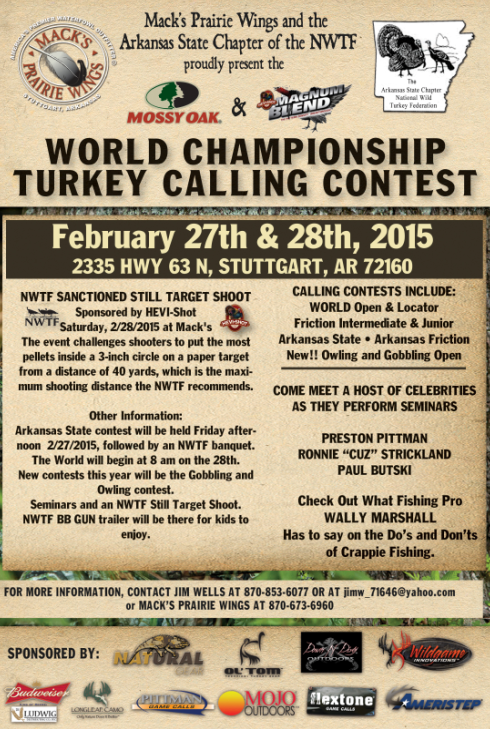 World Championship Turkey Calling Contest - March 4th and 5th, 2016!